September 13, 2018 (LifeSiteNews) – We know why President Trump is so hated. We've heard it time and again. The man is out of control. He's a threat to national security. He has damaged our international standing. He's unstable. He's volatile. He's in totally over his head. No one can work for him. Yet Mike Pence is an experienced politician, having served in the House of Representatives from 2001 to 2013 and as governor of Indiana from 2013 to 2017. Yes, Mike Pence must also go. Away with this man, too! Waters's words drew a sharp rebuke from Trump-supporter Philip Schuyler, who tweeted, "When Maxine Waters says, 'We'll impeach Trump,' she's fantasizing, since he didn't do anything wrong. 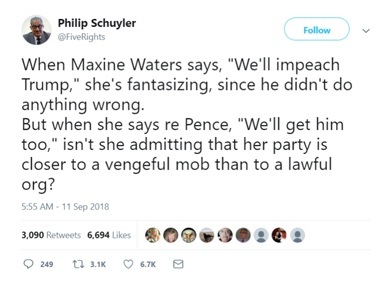 But when she says re Pence, 'We'll get him too,' isn't she admitting that her party is closer to a vengeful mob than to a lawful org?" It's not just Maxine Waters saying this. The anti-Pence rhetoric has been building for months. Most recently, it was Omarosa Manigault Newman who echoed these sentiments. As reported on Yahoo News, "Ms Manigault Newman, who is busy promoting her book, Unhinged: An Insider's Account of the Trump White House, was asked by TMZ which of the top White House executives was worse – the president or the vice president? 'Pence,' she shouted, before being driven away in a black SUV." There's something even worse, and it lies at the heart of Bruni's concerns: Pence "adds two ingredients that Trump doesn't genuinely possess: the conviction that he's on a mission from God and a determination to mold the entire nation in the shape of his own faith, a regressive, repressive version of Christianity. Trade Trump for Pence and you go from kleptocracy to theocracy." In support of this claim, Tylt cited a New Yorker article by Jane Mayer, dated October 23, 2017. According to Mayer, "Pence has the political experience, the connections, the discipline, and the ideological mooring that Trump lacks. He also has a close relationship with the conservative billionaire donors who have captured the Republican Party's agenda in recent years." But that is not the worrying part. Rather, "[e]ven as [Governor] Pence argued for less government interference in business, he pushed for policies that intruded on people's private lives. In the early nineties, he joined the board of the Indiana Family Institute, a far-right group that supported the criminalization of abortion and campaigned against equal rights for homosexuals."